I set off with my itchy skin and made for Cardenuela Riopico. I didn’t know anything about this village other than it was 25 km away and the last place to stop before Burgos, a further 12 km on. So a good hike then. I hadn’t built any rest days into my loose plan and I’m trucking along a bit, trying to steal an extra day to rest up in Leon. Well I say rest up, but if you know me, have read my blog, or have been to Leon then you will have already substituted the words ‘rest up’ with ‘party down’. I met a very ebullient Londoner on the route today, Martin. We didn’t walk together much but we ended up in the same albergue. What an optimistic guy. You couldn’t upset him if you set his car on fire. 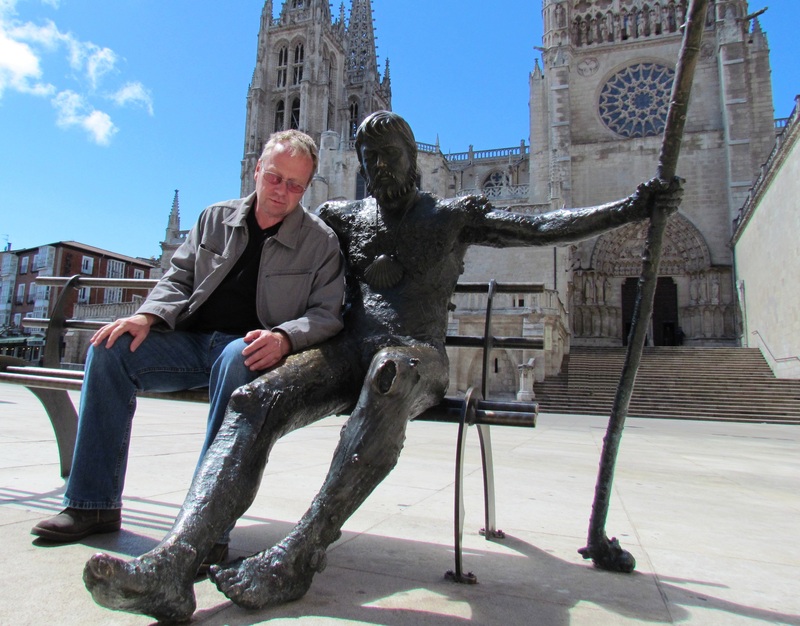 The Camino seems to attract nice people. Seems strange but it does. Lifelong friendships are made on the trail. Age and nationality don’t matter. People have married having met walking along. I have been invited to many people’s homes across the world. Just this week somebody invited me to Northern California and asked me about my town, Harrogate, When would be a good time to visit? Boy could Mariana drink. As luck would have it the people around us didn’t like the wine. I know, I know. Like there’s some mystical place where bad wine exists. Yeah, right. We helped ’em out. As a starter I chose ‘mixed vegetables,’ A selection of vegetables boiled for infinity in water. To prove that they had, in fact, been boiled in water, we were served a nice big ladle of said water. Nice and tepid. I grabbed my non drinking neighbour’s wine glass and drained off the water. Now he couldn’t change his mind about the wine even if he wanted to. I swerved the main course, “vegetarian lasagna.” Mariana gave it a miss too and we both took our job of mopping up all spare wine seriously. We guzzled away, Mariana matching me gallon for gallon. Martin had a few but fell by the wayside as the pro’s moved up a gear. There were mixed views on the vegetarian menu. Vegetarianism is on the rise. And they are getting more aggressive. Once they took what they could get and sat in the corner with their broccoli quiche. Now they make the rules. Well, vegetarians. Don’t come running to me when the towns are over run with pigs. I’ve done my bit. Martin snored all night. In a happy way. His wife told us he would snore if he had too much wine. After an hour I grabbed some sleep in the garden on a sun lounger. I got an early start and headed for Burgos. Rolled in at 10,00, got cash, bought bite relief salve from the farmacia, checked out the cathedral and rolled out before 12.00. Going to Burgos and other places next year by car with The Little Nurse so that was enough for now. We’ll be tourists. On the outskirts of town I found a quiet little park and decided to do something about my itchy legs. It must have looked odd to a passerby, me, on a park bench, trousers round my ankles, dabbing away with a lipstick like device. Before you ask. No, there are no pictures. At least not on my phone. I can’t speak for the paparazzi. An Ancient Vegetarian. Doesn’t Look Happy. Apologies to the bloggers I’m following. Getting behind with your stuff. I’ll catch up soon. Shout out to The Minnesota Four. You know who you are. More pix on IG. Follow from there or FB or Twit. This Camino starts with Camino Two : 1 Onward And Upward, Definitely Upward. Previous postCamino Two: 7, Sprechen Sie Deutsche? Next postCamino Two: 9, Midnight Assassin. I remember the Majestic Hotel, I used to go there every year to Housing Conference. I have drunk some wine in there I can tell you! Cool pic Andrew. Never noticed that guy. That picture was taken early morning before loads of people arrived and filled the square. I like those street statues in Spain. In UK they would be daubed in graffiti of course! I can’t imagine the Majestic being ‘super posh’. I used to stay at the Welford b&b in Franklin Road. They have a picture board outside. Looks like they’re spending real money. Harrogate beds are at a premium every weekend now. The word is out! Thanks for the shoutout to the MN 4! I need to read your wonderful blogs at night because I finish the hilarity and want a vino…and not just a glass! !